This Saturday in Orlando is Monster Jam, a monster truck event held in the Citrus Bowl. I was recently invited to nearby Tampa to see the same show a week early, so I could write up the experience here in this blog. I should preface this review by pointing out that I have never in life before attending a monster truck event (my brain wants to call them monster truck "rallies" but I suspect that word has been out for a few decades.) I kind of vaguely recall the era of Bigfoot in the late 70s or early 80s but don't know much at all about this sport. I brought along my wife and two boys (10 and 7) who were all equally naive about what to expect. Let me just jump to the punchline: by the end of the night, my entire family felt we had a GREAT time and we will be going next year - the only question is whether we buy the cheap seats or spring for the closer ones. Neither are that expensive, really, especially when compared to baseball and football seats. The event starts at 7pm and doesn't finish until a while later (9:30, maybe? Or was it 10:00?) so young kids expecting an early bedtime might be cranky for a bit. But the last half of the show is likely to be gripping for most of them. The show is split into roughly two parts: racing and then "freestyle." Racing is time trials (two trucks on the course of obstacles and ramps/jumps at the same time), and whoever has the lowest score advances to the next round. Eventually there's a winner, but this takes a while, and for a novice it stretches just a little long. My seven year old was getting tired by this point. A short intermission separated the two halves, and then the Freestyle began, which meant each truck would do what it could to impress the judges in a minute and a half--jumps, smashing cars laid on the course, spinouts and doughnuts, and so forth. This part was way more entertaining. Some of the trucks, you see, end up trying to do more than they could handle, and tip over. The excitement of watching almost-tips was way more than I expected. And if someone managed to pull OUT of an expected tip-over, that was cause for a great wave of euphoria rippling through the crowd. Eventually, a couple of the more experienced drivers pulled off a few backflips off the steep ramps, which I have to admit were pretty darn impressive. This is the sort of event that introduces fireworks during the National Anthem. Two kinds, actually. One for the "rockets' red glare" and a different, louder variety for "the bombs bursting in air." There are pyrotechnics when the trucks first arrive also, and an even bigger show, all around the arena, when the show reaches its conclusion. The trucks and drivers are all in a competition for points, which gives the event drama. The fan favorite (and playbill headliner) "Grave Digger" seemed to always score the highest marks, but I'm too ignorant here to know if this is intentional. They inject a lot of info about the drivers - it was father and son in the Grave Digger and Grave Digger Legend trucks on our visit. The cheapest seats in the house cost less than what you'd pay per person for the most expensive movie tickets (IMAX and 3D), yet this stadium event is almost 3 hours long, so it's roughly in line with what "amusement" costs in Florida. It's pretty far afield of the kinds of amusements we usually discuss here in Orlando and Central Florida, but it *is* still an attraction, no doubt about it. We really will be back for this! We did wander the Pit Party before the show, and now that we know the trucks a little better, next time it will be even more of a treat to take pictures with them before the big event. The show on Saturday Jan. 25 takes place in the Citrus Bowl. About: MONSTER JAM® is one of Orlando’s most popular and largest single-day stadium events, attracting capacity crowds of over 60,000 fans. A huge field of sixteen monster trucks will compete in side-by-racing and the fan-favorite freestyle competition. One of the many highlights of this year’s event is the return of fan favorite Dennis Anderson (originator and driver of GRAVE DIGGER) to the city and stadium he calls his favorite. The annual motor sports spectacle is the final event before demolition begins on the Florida Citrus Bowl. Advance purchase SuperValue Tickets are ONLY $15. $35 VIP / $25 Sideline. & Purchase: Tickets are on sale now at all Ticketmaster outlets, the Amway Center Box Office, or charge by phone at 800-745-3000 or ticketmaster.com. Tickets will also be available day of show at the Citrus Bowl. All seats reserved. Subject to facility fee, plus convenience and handling charges. Don’t wait – buy tickets in advance as prices go up $5 more the week of show. Get more show information at www.MonsterJam.com (click on “Tickets” and search for Orlando January 25th). Show Details: Central Florida will heat up this January when 1,500 horsepower, 10,000-pound monster trucks compete in side-by-side racing and the fan-favorite freestyle competition where each monster truck gets up to 120 seconds to “wow” the crowd with huge jumps, wheelies, truck-spinning donuts, flips, and the destruction of cars, vans, buses, motor homes and more. 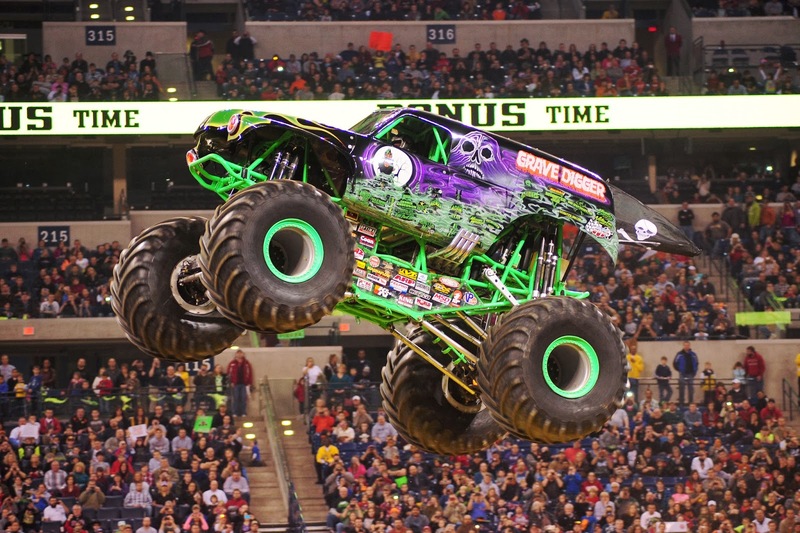 Four-time World Champion, Dennis Anderson, returns to his favorite city driving the legendary monster truck he created 32 years ago, GRAVE DIGGER. After his sensational 2013 debut, Ryan Anderson will be joining his father driving SON UVA DIGGER. The event will also feature 11-time and reigning World Champion MAXIMUM DESTRUCTION, plus Latino favorite EL TORO LOCO, MOWAWK WARRIOR, ICE CREAM MAN, MONSTER MUTT ROTTWEILER, the Orlando debut of Nicole Johnson driving SCOOBY, and more yet-to-be announced motorsports competitors. The official title of the event is Metro PCS, McDonald’s, 1-800-Ask-Gary, Budweiser & Your Southern Ford Dealers present MONSTER JAM®. Fans can go behind the scenes, meet the drivers for autographs and photo ops, and see the monster trucks up close at the World’s Ultimate Pit Party at Tinker Field from 1:30-5pm. Purchase a pit pass for only $10 more when buying tickets at Ticketmaster or the Amway Center Box Office. Or, pick up a free pit pass at participating Orlando area Southern Ford Dealers beginning January 6th (while supplies last). Pit Passes, along with a valid event ticket, get fans into the Pit Area. Fans can also have the opportunity to ride in a real monster truck before the show between 1-7 pm in the lot across from Gate D. Monster Truck Rides are $10 per rider.